AXA awards promo winners USA trip to watch a live NBA game. 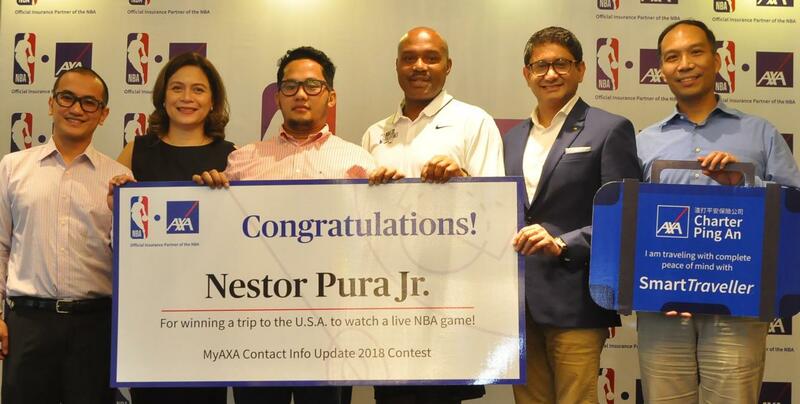 Five-time NBA All-Star Tim Hardaway Sr., together with executives of AXA Philippines, gave two of AXA’s promo winners a trip for two to the USA to experience an NBA game live. Nestor Pura Jr. (3rd from left) won the MyAXA Contact Info Update 2018 promo simply by updating his email and phone number records with AXA. He also received complimentary AXA Smart Traveller travel insurance for his trip so he can avail of 24-hour medical assistance, personal accident coverage, prAotection of personal belongings, and more. AXA is the official insurance partner of the NBA in the Philippines. Photos shows AXA Philippines president and CEO Rahul Hora (2nd from right), NBA managing director Carlo Singson (rightmost), and NBA star Tim Hardaway Sr. (3rd from right) with AXA Philippines chief customer officer Amor Balagtas (2nd from left), and in-force management director Bodek Bautista (leftmost). For more information and updates on AXA’s promos, visit www.axa.com.ph/promos.